One by one I'm picking up the loose threads of life, work, and blog... 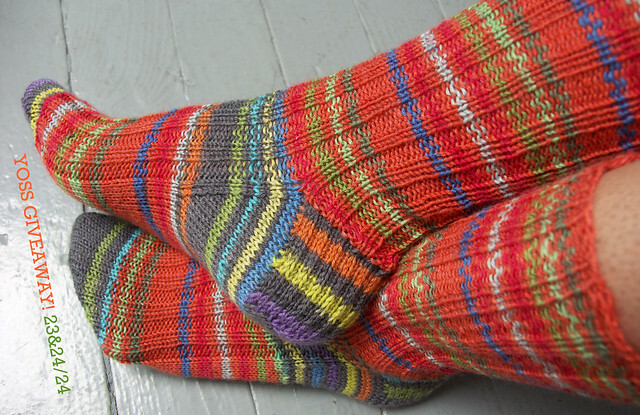 I finished the last pair of 2011 Year Of Stash Socks in April 2012! I knitted them especially for Anna at FreePlayCraft, the YOSS giveaway winner. Below are the twelve pairs of socks and mitts I made in 2011 as part of the 2011 Year Of Stash Socks challenge. Are you interested in knitting socks? - JOIN the 2012 YOSS knit-along on Ravely, with 860 members, they post new sock patterns each month. Proud of my accomplishments in 2011, I've opted to keep a more relaxed sock knitting pace this year... even though my sock yarn stash continues to grow exponentially!